Experience an epic journey of freedom when Exodus: The Real Story arrives on DVD December 9 from Lionsgate Home Entertainment. This comprehensive two-disc collection features five HISTORY® documentaries that explore the biblical telling of Moses’s exodus from Egypt, including Moses and the Ten Commandments, Moses: Death Chase, Joshua: Epic Slaughter, The Secret Life of King Ramses II and The Lost Ark of the Covenant. Arriving just in time for the theatrical debut of Ridley Scott’s new feature film Exodus: Gods and Kings starring Christian Bale and Sigourney Weaver, Exodus: The Real Story will be available on DVD. 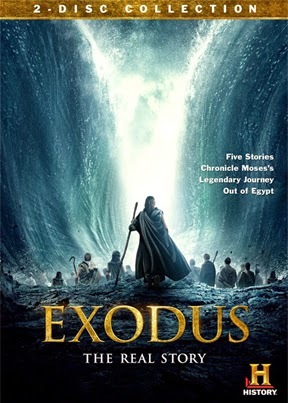 HISTORY® unlocks the truths and myths behind the world of epic heroes and villains in Exodus: The Real Story. Examine the complex soul of the prophet Moses who defeated the Pharaoh and the Egyptian army and led his people out of Egypt. See how Joshua’s army infiltrated and destroyed Jericho from the inside out. Discover the stories of King Ramses II and such ancient marvels as the temple at Karnak and the rock temple at Abu Simbel. Hear the many theories surrounding the Ark of the Covenant, which has never ceased to fuel our belief in its significance although it disappeared 3,000 years ago. With the film coming out this weekend, why not get some more facts... History Channel always makes fiction more factional.